Gluten is the term for a protein component of wheat and similar proteins found in rye and barley. In people with celiac disease, the body mounts an immune reaction to gluten. The immune system goes on high alert. It attacks and damages the small intestine. The nature of this immune response is not an allergic reaction but a delayed type immune response. In digesting the foods we eat, it’s the small intestine that does the “heavy lifting.” This organ performs the major work of breaking the food (nutrients) down into smaller fragments or components in a process that is called digestion. These components are then absorbed by the small intestine. They include protein, carbohydrate, fats, minerals and vitamins. They are then released into the bloodstream which carries them to all the tissues and cells of the body. This process of digestion, absorption and release into the circulation involves the normal functioning of the stomach, small intestine, pancreas and liver. 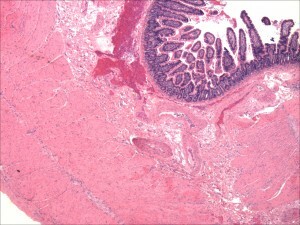 Critical to this process are tiny filaments called villi, which line the small intestine. These microscopic finger-like projections greatly expand the intestine’s surface area, maximizing the effective absorption of nutrients into the bloodstream. When the immune system of an individual with celiac disease goes into overdrive, it attacks and destroys intestinal villi (atrophy). Nutrients cannot be fully absorbed. This results in the term malabsorption. In celiac disease, all the components of the diet (carbohydrate, fats, minerals and vitamins) may be malabsorbed, or only a single nutrient such as a mineral (calcium or iron) or a single vitamin such as folic acid. The ability to take full nourishment from food is compromised. The immune response in the intestine as well as causing atrophy of villi results in a marked inflammatory response and the generation of antibodies to food components (anti-gliadin antibodies and auto antibodies) tissue transglutaminase and endomysial antibodies. These antibodies while not causing any damage reflect the autoimmune nature of celiac disease and are used as diagnostic tests. This marked inflammatory response may be manifested as generalized systemic symptoms while the autoantibodies may be responsible or contribute to other organ damage and symptoms. In celiac disease, this systemic inflammatory response and multiple other organ involvement marks celiac disease as a multisystem disease. In fact, celiac disease more resembles a multisystem disorder with the possibility of every organ in the body being affected. Patients therefore may present with symptoms related to inflammation and malabsorption (diarrhea, abdominal pain and weight loss). Patients may present with manifestations of malabsorption of nutrients such as anemia due to iron deficiency or osteoporosis due to calcium and vitamin D malabsorption. Whereas the skin problem, dermatitis herpetiformis (DH), reflects a systemic antibody response to tissue transglutaminase generated in the intestine but manifested in the skin by these antibodies reacting with tissue transglutaminase present in the skin. Other organ involvement may be the result of nutritional deficiency, antibody directed inflammation as part as an autoimmune response. And once in attack mode, the immune system doesn’t always stop with the small intestine, but may also damage other organs. The classification of the main modes of presentation of adults with celiac disease into “classical” – diarrhea predominant and “silent” is widely accepted. The silent group includes atypical presentations and those presenting with complications of celiac disease as well as truly asymptomatic individuals picked up through screening high risk groups. Children with untreated celiac disease are at special risk. Malnutrition during this period can have significant effects on growth and development. Failure to thrive in infants, learning difficulties in school-age children, irritability and behavioral difficulties, delayed puberty, and short stature as well as recurrent abdominal pain and constipation are all common symptoms of celiac disease. In order to assess the clinical spectrum of celiac disease in the United States, we obtained data on 1138 people with biopsy proven celiac disease. Our results demonstrated that the majority of individuals were diagnosed in their 4th to 6th decades. Females predominated (2.9:1); however the female predominance was less marked in the elderly. Diarrhea was the main mode of presentation, occurring in 85%. Most strikingly, symptoms were present a mean of 11 years prior to diagnosis. In order to assess whether the presentation had changed over time we analyzed the mode of presentation for a series of patients seen in the Celiac Center at Columbia University in New York.4 There were 227 patients with biopsy proven celiac disease. We noted that females again predominated, in a ratio of 1.7 to 1. Mean age at diagnosis was 46.4 ± 1.0 years (range 16 to 82 years) and was similar in men and women. Females were younger and had a longer duration of symptoms compared to the males. Diarrhea was the main mode of presentation (in 62%) with the remainder classified as silent (38%). This later group included anemia or reduced bone density as presentations (15%), screening first-degree relatives (13%), and incidental diagnosis at endoscopy performed for such indications as reflux or dyspepsia (8%). We compared those diagnosed before and after 1993, (when serologic testing was first seen in patients), and noted a reduction in those presenting with diarrhea, 73% versus 43% (p=0.0001) and a reduction in the duration of symptoms, from 9.0 ± 1.1 years to 4.4 ± 0.6 years (p<0001). These results suggested that the use of serologic testing was responsible for more patients being detected with celiac disease having presented in non-classical ways, after a shorter duration of symptoms. Further analysis of the patients seen at the Celiac Disease Center at Columbia University has revealed that progressively fewer patients are presenting with diarrhea, less than 50% of those diagnosed in the last 10 years. Many patients with celiac disease, 36% in our series and 29% of Canadians with celiac disease, have had a previous diagnosis of irritable bowel syndrome. In fact, screening of patients seen in irritable bowel referral clinics in England and Iran reveals celiac disease in a significant number of patients. The majority of patients with celiac disease, detected in a primary care screening study had symptoms attributable to an irritable bowel syndrome. Iron deficiency anemia was the mode of presentation in 8% of the individuals seen by us, 4 and was reported as a prior diagnosis in 40% of Canadians with celiac disease. In a study from the Mayo Clinic, celiac disease was identified as the cause of iron deficiency in 15% of those undergoing endoscopic assessment for iron deficiency. While in a prospective study of adults, mean age in their 50’s, Karnum et al found 2.8% to have celiac disease. Anemia in celiac disease is typically due to iron deficiency, though vitamin B12 and folic acid deficiency may also be present and contribute to anemia. A diagnosis of celiac disease may be made during the evaluation of reduced bone density (osteopenia or osteoporosis). In our study reduced bone density was more severe in men than women. Certainly men and premenopausal women with osteoporosis should be evaluated for celiac disease even if they lack evidence of calcium malabsorption, though the yield in menopausal women is low. An increasingly important mode of presentation is the recognition of endoscopic signs of villous atrophy in individuals who undergo endoscopy for symptoms not typically associated with celiac disease. These endoscopic signs include reduction in duodenal folds, scalloping of folds and the presence of mucosal fissures. The indications for upper gastrointestinal symptoms include dyspepsia, upper abdominal pain or gastroesophageal reflux. This presentation accounted for 10% of those who were diagnosed with celiac disease in our series. Interestingly symptoms of gastroesophageal reflux may resolve after starting a gluten-free diet. This is thought to be due to resolution of an accompanying motility disorder. These endoscopic abnormalities of the duodenal mucosa are not specific nor sensitive markers of celiac disease. There is an argument for the routine biopsy of the duodenum in anyone undergoing upper gastrointestinal endoscopy to detect celiac disease, irrespective of the appearance of the duodenal mucosa. Screening of high risk groups is, especially relatives of patients with celiac disease is a major mode of presentation. Studies reveal that 5% to 10% of first degree relatives of patients with celiac disease have serologic and biopsy evidence of the disease. A single testing of relatives does not suffice to detect all those with celiac disease. For those initially negative by screening antibodies, 3.5% will become positive a mean of 2 years after their initial testing. Other groups that are frequently screened for celiac disease include those with Type 1 diabetes, Down syndrome, and primary biliary cirrhosis. Among the atypical presentations that we have encountered are neurologic problems. We have found that 8% of those attending a peripheral neuropathy center, for evaluation of peripheral neuropathy, had celiac disease. The neuropathy is typically sensory in type, involving the limbs and sometimes the face. Nerve conduction studies are frequently normal; however skin biopsies reveal nerve damage in small fibers. We have also identified patients with severe ataxia. We have not identified patients with epilepsy, a neurologic manifestation that may be more common in childhood celiac disease. Other, less common presentations, are abnormalities of blood chemistry determinations such as elevated serum amylase, secondary to macroamylasemia, hypoalbuminemia, hypocalcemia, vitamin deficiency states, and evidence of hyposplenism. We have seen patients referred because of dental enamel defects. Many females diagnosed with celiac disease have a history of infertility and there is a yield of screening infertile individuals for celiac disease. Many people with gluten intolerance experience symptoms mainly as Dermatitis Herpetiformis (DH), a chronic disease of the skin. Patches of intensely itchy raised spots appear on the body, often symmetrically, on both elbows or both buttocks for example. However, it can occur anywhere on the body. It may occur on the face or in the hair, especially along the hairline. In this case, the immune system’s response consists of an immune reaction of anti tissue transglutaminase antibodies with a special form of tissue transglutaminase found in the skin. The lesions will typically form little blisters resembling herpes, hence its name, dermatitis herpetiformis. Everyone with DH is considered to have a gluten sensitivity (celiac disease). While the majority of people will have an abnormal intestinal biopsy that demonstrates the characteristic changes of celiac disease, in 20% the biopsy can be normal. The diagnosis of DH requires a biopsy of skin immediately adjacent to a blistering lesion. Special studies (immunofluorescence for IgA deposition) are required for diagnosis. The lesions are very sensitive to ingestion of small amounts of gluten. Some patients require therapy with Dapsone to suppress the lesions. This may be used intermittingly and is not needed when patients are adhering to a strict gluten-free diet. Withdrawl of iodine from the diet may be necessary for the gluten-free diet to have a beneficial effect. Patients with DH are a risk for all the complications that those with celiac disease but not DH experience. These include osteoporosis, iron deficiency anemia and vitamin and mineral deficiencies. Patients should be assessed regularly for these complications and treated accordingly. DH similar to celiac disease is associated with an increased risk of lymphoma. The gluten-free diet will protect against the development of lymphoma whereas Dapsone does not. A common problem is that patients will use Dapsone to control the lesions and not adhere to a gluten-free diet. Autoimmune damage, the first manifestation of celiac disease, carries with it an array of potential symptoms. But as happens so often in life, one thing leads to another. When the immune system compromises the ability of the small intestine to absorb and transmit nutrients, malnutrition may result. And malnutrition carries its own array of potential disease symptoms. 250 different celiac disease symptoms and related conditions have so far been identified, among them. However the spectrum of the disease is very great with some people obese rather than malnourished. Patients often have a vast array of symptoms and complications, not justone symptom. Here is a list which is not exhaustive. Patients with thesesymptoms warrant screening for celiac disease.